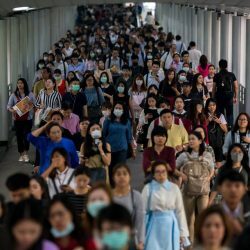 The N95 face masks which are capable of screening PM2.5 dust particles are selling like hot cake as many Bangkokians rush to convenience and drug stores to get the protective gear against the worsening health-threatening air pollution in and around the city. 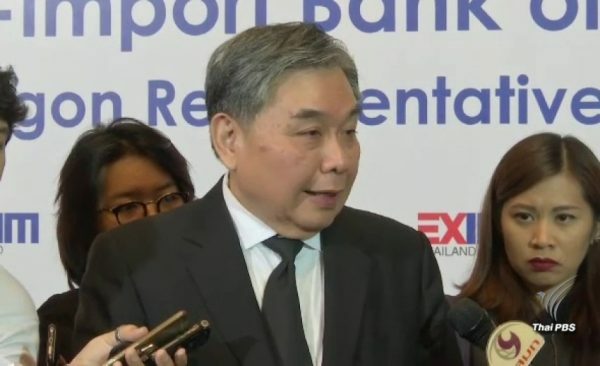 A Thai PBS news team today conducted a random survey of convenience stores and found out that several of them had run out of stock of N95 face masks. Staff of the stores said that they had asked for more supplies from the head offices. The news team managed to talk to a user of N95 mask, Ms Kanda Yamboonruang, who said that she was suffering from dust allergy, adding that when she heard about the worsening air quality in Bangkok, she bought the N95 face masks for use at 79 baht for a set of two. However, she said that a mask could be used with effectiveness for just one day and then had to be disposed of. 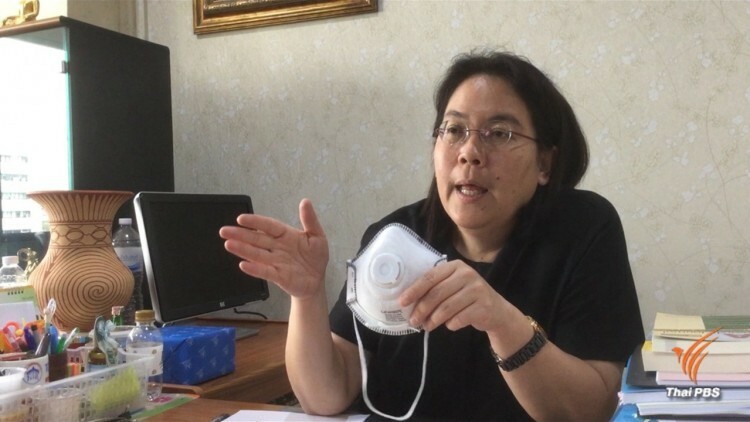 Ms Kanda admitted that she felt secured when wearing the mask because her office is in Din Daeng, one of the areas listed by the Pollution Control Department as health-threatening with excessive amount of PM2.5 dust particles. 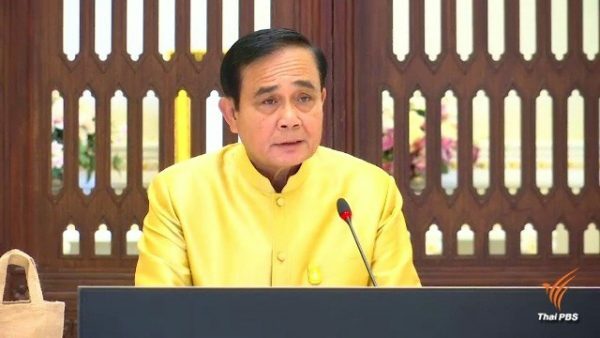 Dr Chanthana Padoongtos, director of Office of Occupational and Environmental Diseases, said that air quality in Bangkok had been classified in orange category which means that people who are out-door for long hours should wear N95 face masks. For those who cannot afford the N95 face masks, she recommended the use of towel soaked in water to cover up their noses which could help to a certain extent on the condition that they must not stay too long in the open. 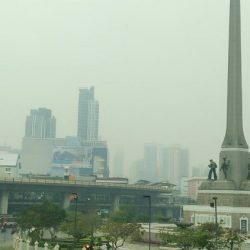 The Pollution Control Department reported that the amount of PM2.5 dust particles was measured at between 60-81 microgram/cubic metre in 18 areas in Bangkok and its peripherals, with Rama III-Charoen Krung road in Bang Kor Laem district as being the worst polluted. 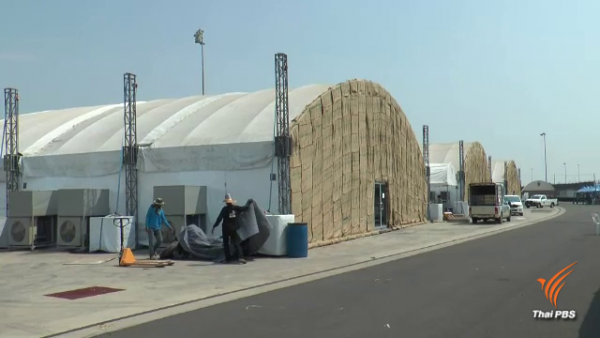 Sixteen areas which are far away from roads have also been found with excessive amount of PM2.5 dust particles, with the worst condition in Tambon Nakhon Pathom of Nakhon Pathom province and in Tambon Songkhanong of Phra Pradaeng district, Samut Prakan province.